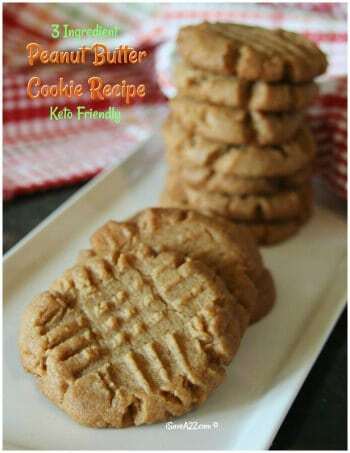 I’m going to straight up warn you that this recipe is addicting! 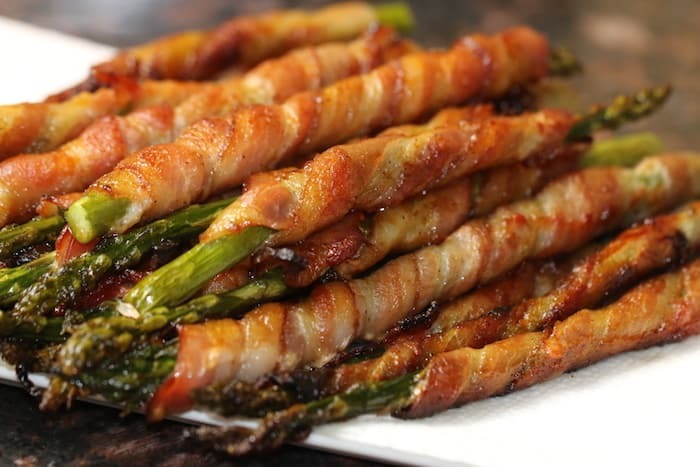 Our family loves bacon wrapped asparagus but not just bacon and asparagus. 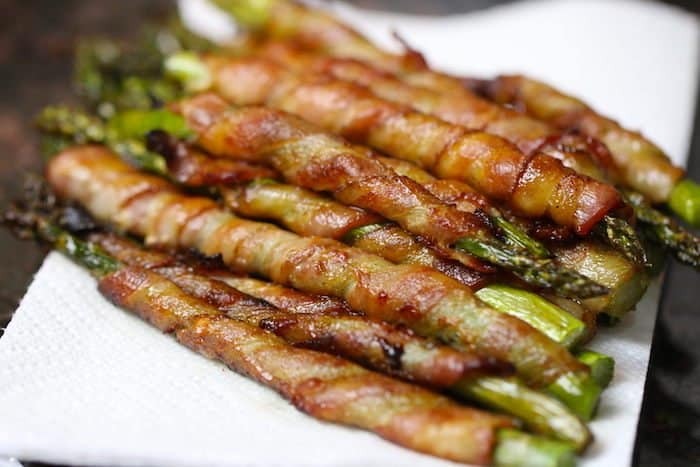 I mean, anything coated with bacon is great but we are so used to eating this Non-Keto Bacon Wrapped Asparagus recipe found on the Sweet and Simple Living website but it no longer fits our Ketogenic diet way of eating. It’s made with brown sugar and we definitely don’t eat sugar anymore. 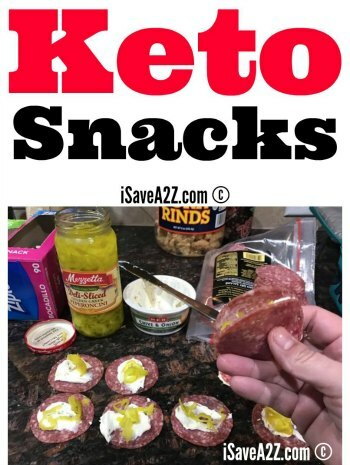 My girls challenged me to make a similar recipe but with keto approved ingredients. The challenge was on and the outcome was a total hit! Let me talk a little bit about the secret sauce. This sauce is what put this recipe over the top. 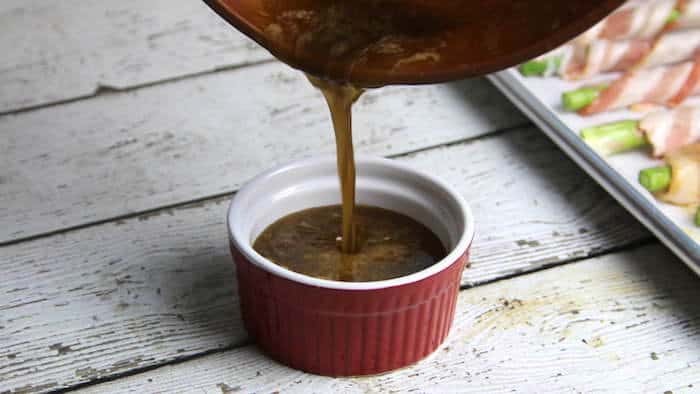 Do you need to make this recipe with the secret sauce? The answer is no. Is it amazing? Yes! Most definitely. 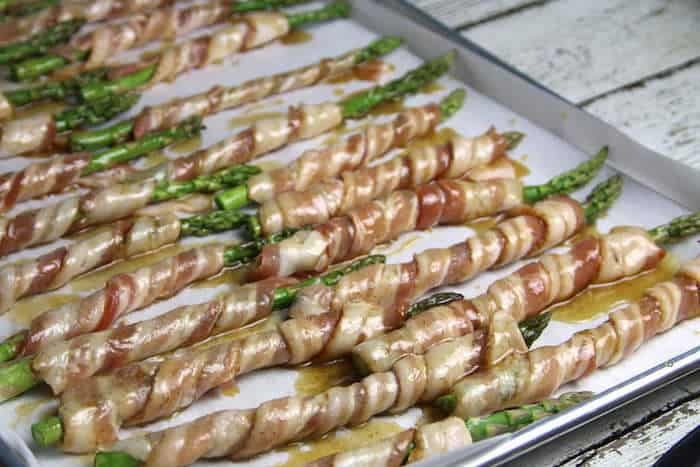 But I want you to know that you can make this recipe without any sauce and it will still taste pretty darn good when the asparagus is wrapped and cooked in bacon grease. There are a few ingredients I used for the sauce but this ingredient I had to plan for because it’s not found anywhere in my local stores. I used the ChocZero Sugar-Free Maple Syrup! This recipe is not sponsored in any way. I fell in love with the ChocZero brand when I met them at a Keto conference I went to about a year ago. I have not tried one of their products that I didn’t like. I’m super sad they are not conveniently found in my local supermarkets though. ChocZero Products on their website directly here. ChocZero Store products sold on Amazon here. I personally get most of my ChocZero products on Amazon because of prime shipping. Here is the direct link for the ChocZero Honest Maple Syrup. You can see on their website that the syrup does not have any sugar alcohols. 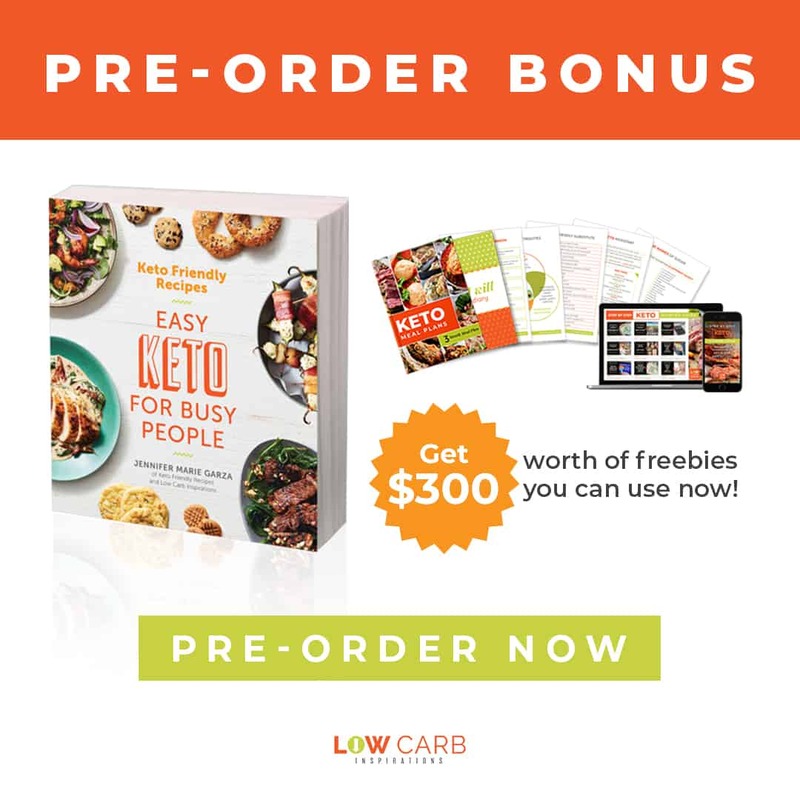 Its main ingredient is liquid fiber followed my natural Keto approved sweeteners. I’ve not been able to find a thick syrup that is Keto friendly until now. Take a look at the nutrition label they have listed too. It’s only 30 calories for a tablespoon of syrup with 13 carbs and 11 dietary fiber making it only 2 net carbs per serving! 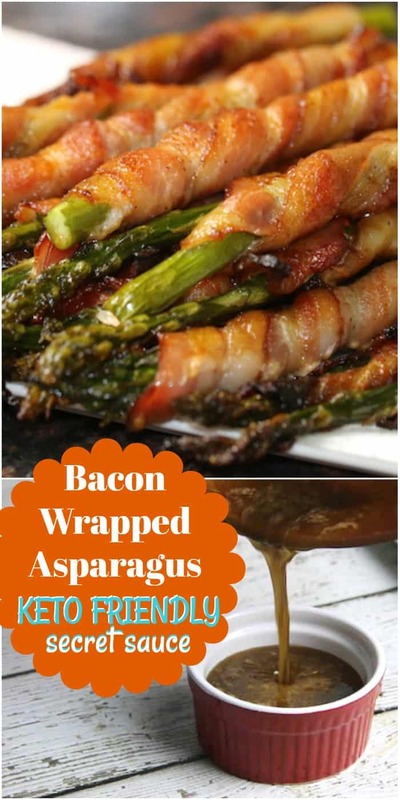 If you plan on making this recipe, you will have to order this product ahead of time but it’s totally worth it! Plus, you can use it in lots of other recipes too. My kids love it on their Keto pancakes or their Fluffy Keto waffles too! 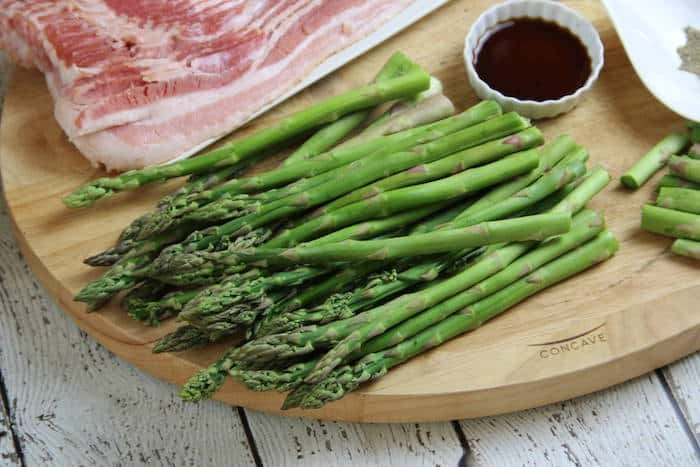 Wash and prepare the fresh asparagus by cutting off the ends. Pat dry. 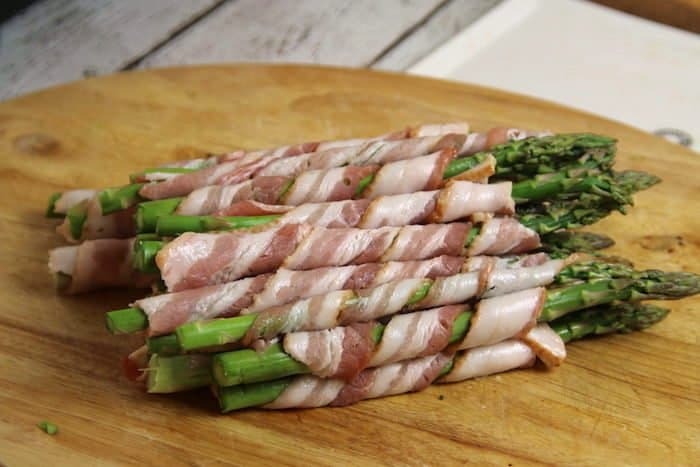 Wrap a piece of bacon around each asparagus. 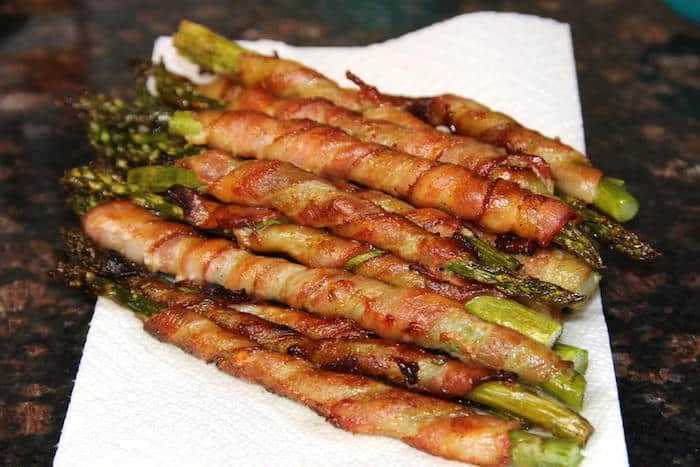 For larger pieces of asparagus I used a full slice of bacon and for smaller pieces, I cut the bacon strips in half. 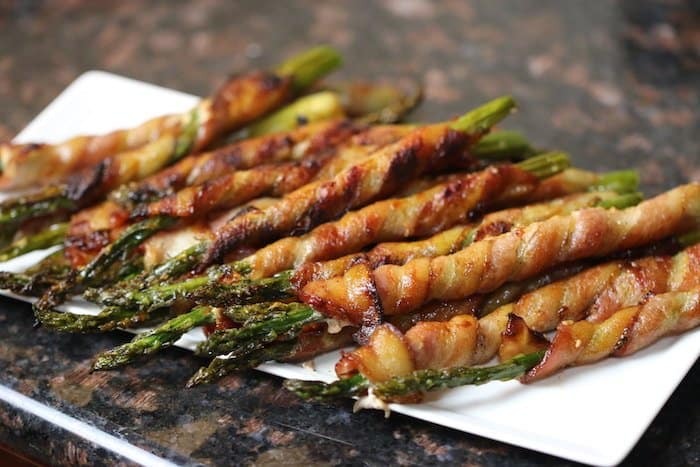 Lay the prepped asparagus strips on a baking sheet lined with parchment paper. In a small pan, melt the butter, coconut aminos, and syrup over medium heat until it becomes a bit thick and bubbly. 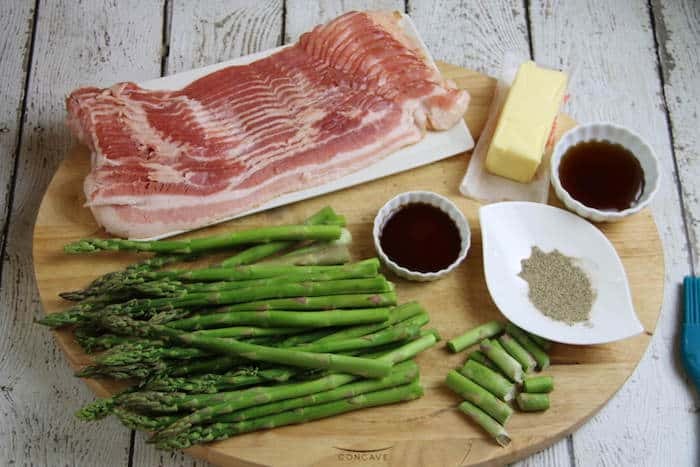 Use a basting brush and coat each strip of asparagus with the syrup mixture. 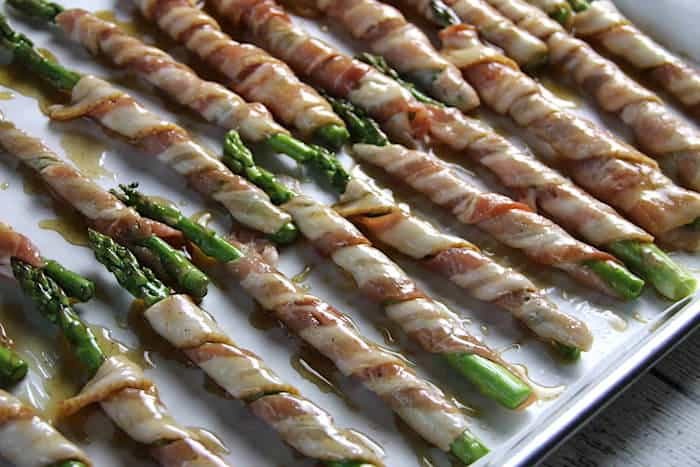 Bake it at 400 degrees for about 20 minutes or until the bacon becomes nice and brown to your liking. 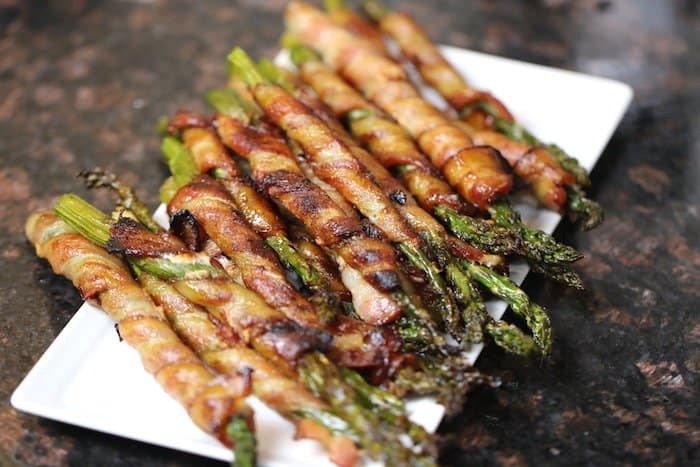 I used a thin cut bacon in this recipe but if you decide to use a thick cut bacon you might need to bake it for an extra 5 minutes or so. I always try to purchase sugar-free bacon but the struggle is real. 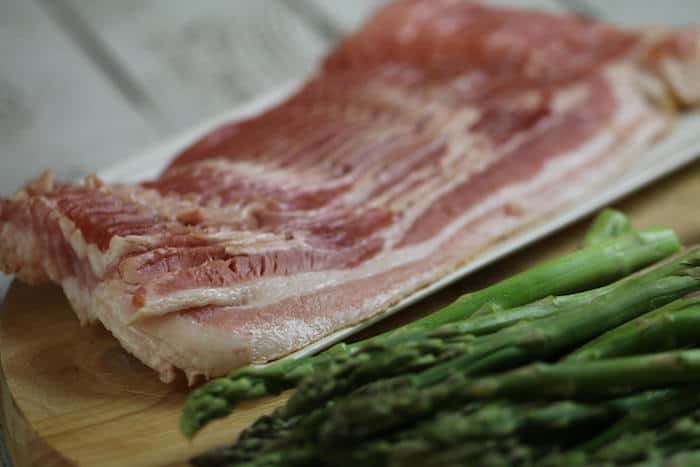 If you are lucky enough to have a Trader Joe’s near you, I hear they have an uncured smoked bacon that is pretty good. We have tons of conversations about all things related to the Keto diet and Low Carb diet in the Low Carb Inspirations group on Facebook. It’s my go-to place when I have a question and need someone with experience that can help me figure it out. I want to encourage you to join it! It’s been a lifesaver for me to be around like-minded people on my same journey. Don’t forget to pin it on Pinterest for later too! In a small pan, melt the butter, coconut <g class="gr_ gr_111 gr-alert gr_spell gr_inline_cards gr_run_anim ContextualSpelling" id="111" data-gr-id="111">aminos</g>, and syrup over medium heat until it becomes a bit thick and bubbly. 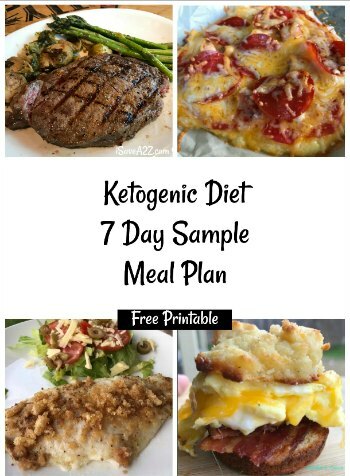 By Jennifer on August 1, 2018 Keto Dinner Recipes, Keto Friendly Recipes, Keto Lunch Recipes, Low Carb Recipes, Recipes.